Sterile paper points help to prevent the root canal from recontamination after thorough cleaning and desinfection. 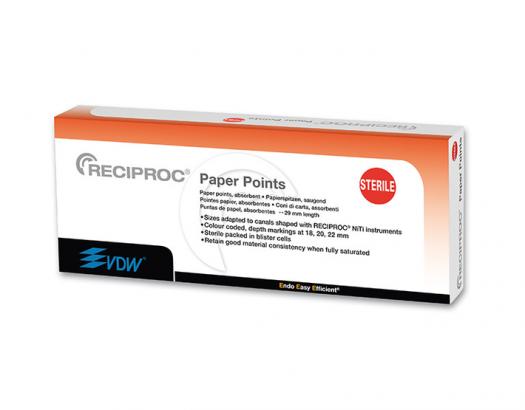 There are highly absorbent and pre-sterilised RECIPROC® Paper Points corresponding to instrument sizes R25, R40 and R50. For convenient use they are packed in blister cells of four paper points each. Sterile paper points help to prevent the root canal from recontamination after thorough cleaning and desinfection.